Club Penguin Cheats by Mimo777 Club Penguin Cheats by Mimo777: Club Penguin Adding Chinese Language? Imagine trying to understand that... Hard! Cool!!! XD That's so weird! Chinese letters are really weird. cool my sister is learning chinese and she could practice on this! 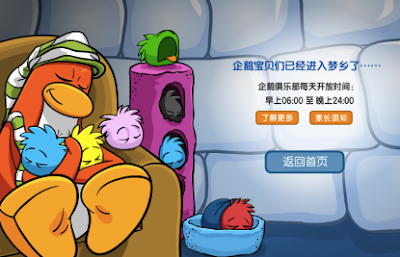 It says Penguins are sleeping from 6:00 to 24:00 and severs are closed from the above times. Also how do you get that?! the portal box glitch has been fixeed. nvm; i only got into the portal box once its blocking me out now. I said : The Chinese language is hard!! :) If one day CP makes the Arabic language,I'll be there first to translate! ;) Until then,Chinese people wanted! The same thing happened to me. I think it does it because they are just testing it first. COOL! now i can talk to people who understand chinese! because i can speak, understand, read and write chinese! where did you find the last pic? how did you get it! i cant seemto get it! Hey Mimo! I found a cheat! On your stamp book you can take any stamp and if you click on one and hold it down then use the arrow keys and it rotates! WOW!!!! I would REALLY want to try that out! I need to get that Chinese version. Woo hoo! Chinese names usually aren't long. They're 3 characters each, in which the first character is the surname, and the second one is their name. Mimo! I found a glitch! If you go to the far left of a room (try the mine shaft then click to walk to the far right of the room then quickly open and close the newspaper, you will slide to the right side of the room! It's really cool!!! Hopefully CP won't fix it! Please give me credit. I wish they put the language gaelic (irish language). Hey mimo did you know that when you try to save your password a diffrent thing comes! You will see three of the following messages. They could spend your coins. They could change your igloo. They could get your penguin banned! Cp is getting more awesome sauce every day! It could of been Japanese...Chineses and Japaneses are praticlly the same. Are you sure it's Chinese?Maybe it's Japanese!Buddytoe, Chinese letters can be really weird but my language has really weird letters!1 of my friends said it looked like ancient symbols! Wǒ yǒngyuǎn bù huì liǎojiě zhèxiē zhōngguó qìé shì zài shuō shénme! Dāng qìé shuō le shénme, xiànzài wǒ shén zhì bùnéng shǐyòng gǔgē fānyì, yīnwèi zhèxiē guàiyì de hànzì! Qìé jùlèbù, zhìshǎo shǐ zhōngguó wénzì zhuǎnlù, zhèyàng wǒ jiù kěyǐ shǐyòng gǔgē fānyì! (Lol in English that means, I won't ever understand what those Chinese penguins are saying! When a penguin says something, now I can't even use Google translate because of those weird Chinese characters! Club Penguin, at least make the Chinese words transcribed, so I can use Google translate!) Now when I go to the Chinese servers it's going to be so complicated. I don't speak any Chinese, so I used Google translate for that Chinese thing. i know because i SPEAK AND WRITE chinese. Glitch! Go to the ski hill. Pull up your Spy Phone. Go Sled Racing. Your spy phone should be there! For all of your information, the second screen, translated, will be as follows. Club Penguin will be open from 6AM to 12AM. I am a Singaporean so that makes me able to know both English and Chinese! Gotta dash, my breakfast is waiting for me! how do you find this? you said it says it when you try logging in. Mimo, have you seen the one where if you want to save your penguin on the login screen it shows you like a whole clip of things you should be ware of or something its weird. No there not!!! I love chinese!! I'm chinese myself btw. :( I'm actually chinese and my chinese stinks because my school is english. Cool!!! I am SO gonna try the Chinese servers... even though I don't speak Chinese! LOL! Cool! Thanks for the translation! I wish club penguin was in slovenian language. i found something really weird out! Wait never mind:L my computer had a glitch.sorry! Actually, Chinese, korean, japanese (mostly all asian) use symbols. These symbols, while translated to english, usually mean 2-3 english letters. Hey mimo, in almost all the rooms in club penguin, you can see lines on the screen! Mimo, in the 1st pic with all the penguins, does the boy penguin have a unibrow?! LOL Thats sorta funny. Hmm.... I tried this but it didn't work for me. Speaking of which, I did not know that Club Penguin gives China a restriction for when they can play, unlike the other states. Weird! This is REALLY COOL!! I'm Chinese and I seriously love it! I'm a chinese girl, and i can assure you that chinese is much harder than english. it's also very different - english has 26 letters, but chinese has many many combinations of strokes to create characters and words. i'm looking forward to this - club penguin is expanding! Chinese??? Sweet! 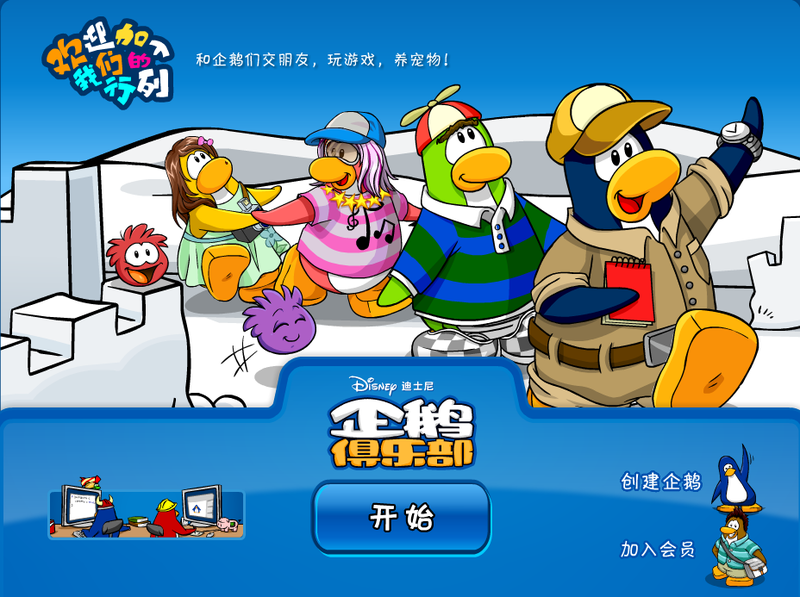 When it launches I can improve my chinese and play Club Penguin! Why do you speak Irish? I do! Dia duit! Is maith liom Club Penguin. That means Hello! I like Club Penguin! Why do you want them to add Irish anyway? Are you from Ireland? I think it would be a good idea too, a great way for Irish students to practise the language! To read Chinese go to Google Translate and copy the words into English.